By virtue of oil and gas production being concentrated mainly in the Russian north, this territory suffers environmental disruption at the largest scale. The southern tundra and forest-tundra biomes of Yamal have been affected most strongly (Table 20.3). The impacted areas significantly exceed the areas allotted for industrial use. For example, 2 per cent of the total Yamburg gas field (the second largest in Russia) area was allotted to gas industry installations. Analysis of satellite data, however, has shown that the vegetation cover and upper soil horizons are completely destroyed within 5 per cent of the area; the area of strongly disturbed vegetation (biomass decreased by 40 per cent to 60 per cent) covers approximately 15 per cent of the territory; and damaged vegetation (biomass decreased by 20 per cent to 30 per cent) occupies another 25 per cent (Vilchek and Bykova, 1992). Clearance of vegetation and soil disturbance can cause degradation (thawing) of permafrost (French, 1996). Construction works and the movement of heavy vehicles over permafrost in summer when the surface is thawed are the main sources of land disturbance (Plate 20.1). In Russia, it is a common practice to relocate drilling derricks and heavy equipment by connecting a few tractors to a single vehicle that 'ploughs up' the tundra, forming deep furrows that trigger soil erosion and thawing. As vehicle tracks become filled with water and mud, new routes are picked alongside the existing ones. Drilling pads, which are located at a short distance from each other, have their own access roads, pipes, and powerlines. The use of modern technology could replace up to twenty of such pads with a single drilling point (Pearce, 1993). Warm oil pipelines running through permafrost terrain cause thermal disturbance (Plates 20.2 and 20.3). To minimize the problem, raised pipelines are constructed and most of the minor pipelines, connecting wells and processing facilities are of this type. However, few of the trunk pipelines are the raised ones with the notable exception of the world's northernmost Messoyakha-Norilsk pipeline, connecting the gas fields of the Gydan peninsula with the non-ferrous smelters of Norilsk. The raised gas pipelines are, however, not an ideal solution since they are prone to accidents. Chemical and oil pollution, resulting from the spreading of solutions used to ease drilling, discharges produced by drilling installations (which consist of clay, alkalis, cement slurry, and diesel fuel), oil escaping from boreholes and, most importantly, oil spills have significant impacts on biotic complexes. A single oil well produces approximately 40 000 m3 of wastes which are usually buried in pits dug nearby (Pearce, 1993). While Western environmental regulations require that such pits have an impermeable lining, there is no such requirement in Russia. Sand and soils provide no protection from oil percolating underground. A simple system of oil collection and surface water drainage could significantly reduce pollution. However, these methods are not commonly used. Harsh environmental conditions and poor maintenance lead to frequent oil spills (accidents in the north occur much more often than in the Volga-Urals and Caspian regions). Over 600 large oilpipe breaks are registered annually in the Ob basin with 3-10 million tonnes of oil being spilled. Smaller accidents are much more frequent; 3 5 000 accidents leading to oil spills were registered in 1996 across Russia.' Each year between 7 per cent and 20 per cent of extracted oil (between 15 and 20 million tonnes) is lost through accidents on the Russian pipelines (Kutsenko and Danilina, 1997), which significantly exceeds a planned loss of 2 per cent. It is estimated that between 30 per cent and 50 per cent of pipeline accidents occur as a result of steel corrosion, with probability of a spill growing with the duration of pipeline exploitation. At present, about a half of all oil pipelines in Russia are over 20 years old and in need of replacement. About 30 per cent of accidents are accounted for by the low quality of pipes and poor welding and between 5 per cent and 20 per cent of accidents occur due to unintentional damage such as hitting by vehicles (Mironyuk, 1993). The gas pipeline system, although in need of refurbishment, is in a better position. Despite the ageing of pipelines, the number of accidents has been declining since the mid-1970s and through the 1990s due to a better quality control by Gazprom (IEA, 1995). One of the largest accidents in the history of oil industry in Russia was the Usinsk oil spill, which occurred in 1994 on the Vozey-Usinsk pipeline, delivering 90 per cent of the Komi Republic's oil (Vilchek and Tishkov, 1997). The accident received much attention from the international media. According to the estimates made by the State Committee on Hydrometeorology and Environment and Geopolis Joint Stock Company, approximately 120 000 tonnes of oil were released and an area of 70 km2 (Figure 20.3) was contaminated (UNEP, 1994). Exploitation of the pipeline began in 1975 and the first accident leading to an oil spill occurred in 1988. Thirty breaks on the pipeline leading to oil leaks had been registered between 1988 and 1994. However, the operation of the pipeline had never been terminated. 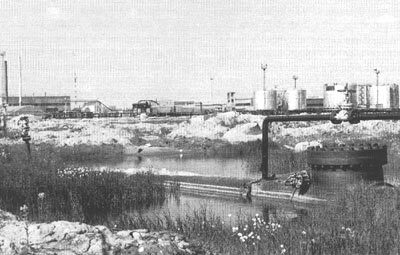 Even throughout the time of the Usinsk accident, it continued to pump oil.5 As a result of the accident, extremely high levels of pollution by petroleum products occurred: concentrations of benzol in the upper horizons of soils reached 12 mg g-1 and levels of xylol were as high as 3 mg g-1, exceeding the Russian standards by a factor of 38 and 60, respectively. Concentrations of oil in snow varied between 1000 ng 1-1 and 2000 ng 1-1 with a maximum registered concentration of 6000 ng l-1. The clean-up attempts involved burning oil which in turn had led to the release of such highly toxic hydrocarbons as benzo(a)pyrene and benzoperylene into the atmosphere. Concentrations of benzo(a)pyrene in snow around the places of oil burning reached 34 ng l-1 and concentrations of benzoperylene were as high as 32 ng 1Л Most of the spilled oil was accumulated in mires. 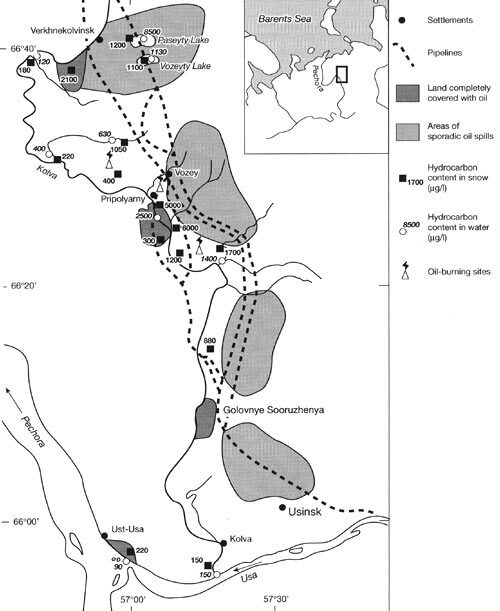 However, a large proportion of it was transported to the Kolva, Usa, and Pechora rivers. Concentrations of petroleum in water varied between 8500 mg l-1 in proximity to the points of release and 150 mg l-1 in the mouth of the Kolva river. Oil films on the water surface of rivers Kolva and Usa reached 10 km in length, and covered about 70 per cent of the water surface of the Pechora river (Krupenio et al., 1995). Accumulation of oil in the bottom sediments had led to considerable contamination of sediments with concentrations reaching 14 mg g-1. Large oil spills (of the Usinsk spill magnitude) occur once in two or three years. 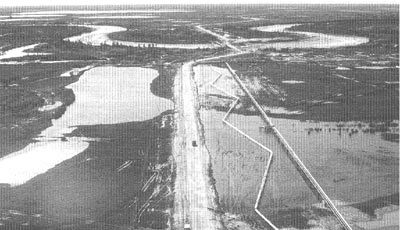 Thus, an accident leading to the release of 500 000 tonnes of oil occurred in the Tyumen oblast in July 1990; 420 000 tonnes of oil spilled to the Ob river in the spring of 1993; in 1996, 3 million tonnes of oil was spilled in the river Bolshoy Balyk as a result of a pipeline accident in the KMAO in Western Siberia (Kutsenko and Danilina, 1997). In the context of insufficient investment, the extreme environmental conditions which cause the rapid wear of equipment is the main reason for accidents on the pipelines of the north. However, the fact that work at oil- and gasfields of Siberia is performed by migrants, drawn to the north by high wages, may also be a contributing factor. Thus, in the mid-1980s, one-third of the drilling work in the Tyumen oblast was performed by the shift method by workers flying from the Volga region (Lavrov, 1991). The lack of concern by migrants for the natural environment of the north, combined with the low priority of ecological issues for the oil companies, are other contributing factors (Arikaynen, 1991; Lavrov, 1991; Chance and Andreeva, 1995). Serious problems are associated with the aftermath of oil pollution. Oil can be diffused into the soil profile to a depth of 50 cm, which leads to soil contamination, increase in soil density, rise of salinity, and surface cracking (Solntseva, 1995). Lichens, moss, and shrubs suffer major damage; the tree cover survives if oil covers less than 20 per cent of the surface (Gashev et al., 1989; Vegerin et al., 1989). Low temperatures retard biochemical processes, controlling breakdown of pollutants, and plant-growing rates in the north, and because of it the self-cleansing capacity of the ecosystems is low. 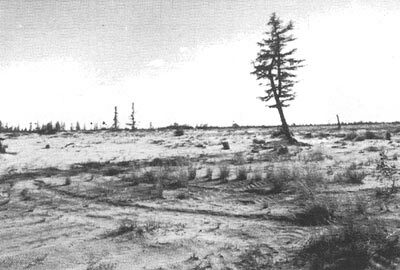 Natural recovery of soil and vegetation contaminated by oil takes 50-60 years (Bratsev, 1988). Oil pollution affects wildlife, particularly fish and waterfowl birds. Lemmings are often trapped in small depressions filled with oil while diving birds die through drowning or toxic effects of ingested oil (Balakhonov, 1988). Contamination of nesting bird eggs results in death of the embryo through asphyxia (Braude, 1987). A total of 370 000 tonnes of oil and petroleum products were transported to the Arctic Ocean by the rivers Ob and Yenisey (Federal Report, 1997). Although, overall the content of dissolved petroleum hydrocarbons in the Russian sector of the Arctic Ocean does not exceed the standard of 0.05 mg l-1 (Roginko, 1991), high concentrations are frequently observed in estuaries of rivers that drain the oil-producing areas. Thus, over 120 000 tonnes of dissolved hydrocarbons, including highly toxic benzol and benzo(a)pyrene, are annually delivered to the Ob delta. Concentrations of petroleum in water exceed a standard of 0.3 mg l-1 by a factor of 10 and in the bottom sediments by a factor of 20 (Federal Report, 1993). This area provides a habitat to commercially valuable species offish. Pollution by hydrocarbons leads to the reduction of dissolved oxygen contents in water which is particularly damaging in the northern context because the Arctic fish species require high levels of oxygen concentrations (Rusanov, 1985). Contamination of bottom sediments damages larvae, destroys wintering pits and spawning grounds and decreases the possibility of normal reproduction. According to the Siberian Institute of Fishery, about 1200 streams and 250 rivers have lost their marketable fish resources due to pollution (Western Siberia North, 1992). It is estimated that in the Tyumen oblast 18 500 tonnes of fish is lost annually due to pollution from the oil industry (Mazur et al., 1990). The loss of wildlife has a critical impact on the welfare of indigenous peoples (Khants, Mansis, and Selkups) for whom hunting and fishing are traditional occupations. Oil pollution may have wider implications. The penetration of petroleum products into snow cover and rivers may bring about changes in heat, moisture, and gas exchange processes between the ocean and the atmosphere. Oil films reduce evaporation by approximately 50 per cent and the ice growth rate by a factor of 1.5 (Rusanov, 1985). Oil films decrease albedo of ice and snow by 10-35 per cent, resulting in earlier and more intensive melting. In the spring and summer, snow melts 5-10 times faster in polluted areas than in the clean environment (Izmailov and Simonov, 1986). The hydrocarbon industry is a large source of air pollution. Natural gas, which occurs in the upper strata and is characterized by low productivity, is not processed but burnt in torches. In Western Siberia, over 19 billion m3 of natural gas is burnt annually (Vilchek et al., 1996). Drilling wells are another source of atmospheric emissions (Table 20.4). Deposition of atmospheric pollutants in close proximity (500 m) to oil wells reaches 4.4 kg m-2 (Voevodova, 1988). Deposition of dust and hydrocarbons on snow leads to early snow melting and degradation of permafrost. The amount of artificial heat produced by burning natural gas is comparable with the annual radiation budget of the area (Pokrovskaya, 1988). Mass deaths of migrant birds in gas torches are widely known (Paskhalny, 1988).